Michelle Lopez is a Chicago Math and Science Academy (CMSA) graduate, class of 2014. Currently, Michelle is attending the University of Chicago majoring in English Language and Literature. Daood Shah is a Chicago Math and Science Academy (CMSA) graduate, class of 2016. Daood has earned his associate’s degree at Oakton Community College (2018). 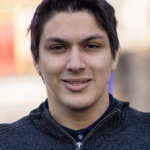 He is transferring to UIC to continue his studies in Computer Engineering.in the Fall 2018.